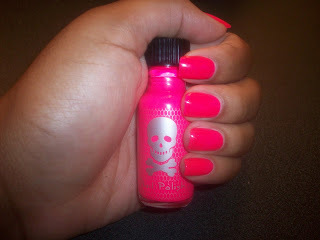 Continuing with the hot pink trend I decided to give this daring color a try. I LOVE IT!!! Some times when you buy a polish it looks one way in the bottle and you think you wont get the same color pay off on your nails but that is not the case here. I picked this killer color up at Hot Topic for $2.99 and there are so many different choices to choose from. My only complaint is the brush is a bit hard so it creates streaks as you do your nails which means you have to add an extra coat. i love that bright pink! very cute! pinks and oranges are so IN right now.